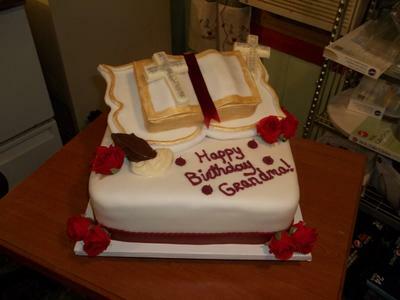 This cake was made for someone's Grandma who is dedicated to her church. The base cake is (3) 11x15 yellow cakes carved to make a 2 layer cake, covered in fondant. The roses are silk roses which I purchased at Michael's Dept. store. The easel is a cake board cutout covered in fondant. The Bible is made out of pound cake, wrapped in fondant. The top pages of the Bible are fondant laid over very small strips of pound cake to give it the rolling look. The gold pages were painted on with a paint brush, using Wilton's gold dust mixed with vanilla extract. The two crosses are made Wilton's white candy melts with silver metallic flakes added in. The praying hands were also made of Wilton's white and cocoa candy melts. The molds for the praying hands and the crosses were purchased at Hobby Lobby and they are very inexpensive. I absolutelly love this cake. you did greaaaaaaaaaaaaaaaat. TOM THAT IS THE MOST FABULOUS CAKE I HAVE EVER SEEN, SUCH GOOD WORK. I STILL ASK U WHEN ARE U GOING TO OPEN A BAKERY??? ?